Christmas Cookies Cookies ~ Learn, Live, and Explore! Is there such a thing as method cookie decorating? Even if there isn't, can we all agree things in miniature can be utterly amazing? I was inspired for the cookies on a cookie sheet cookie (note: 50% of the last 6 words were cookie - impressive?) from a post by Munchkin Munchies in 2011. 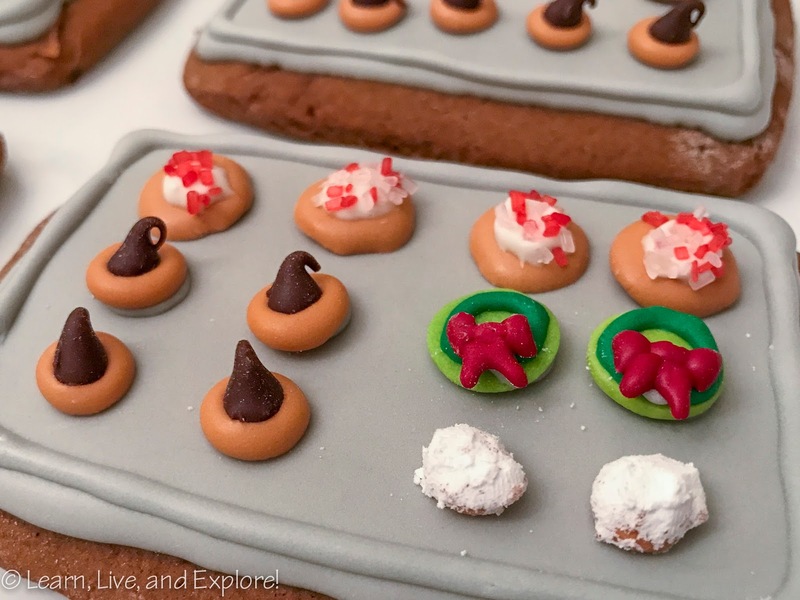 Rather than try to imitate her post exactly, both the sheets and the cookies, I thought it would be more fun to make miniature cookies that I would actually take to a Christmas cookie exchange in real life. Those cookies obviously included frosted sugar cookies, gingerbread men, mexican wedding cookies, decorated cookies (the wreaths), and peanut butter kisses. I believe I posted on some or all of these maybe 3 or 4 years ago, in fact. 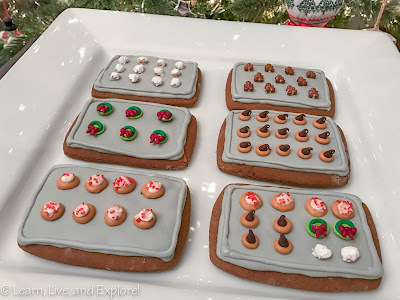 To make the cookies, I just used a simple cut out gingerbread recipe and a rectangular cutter. 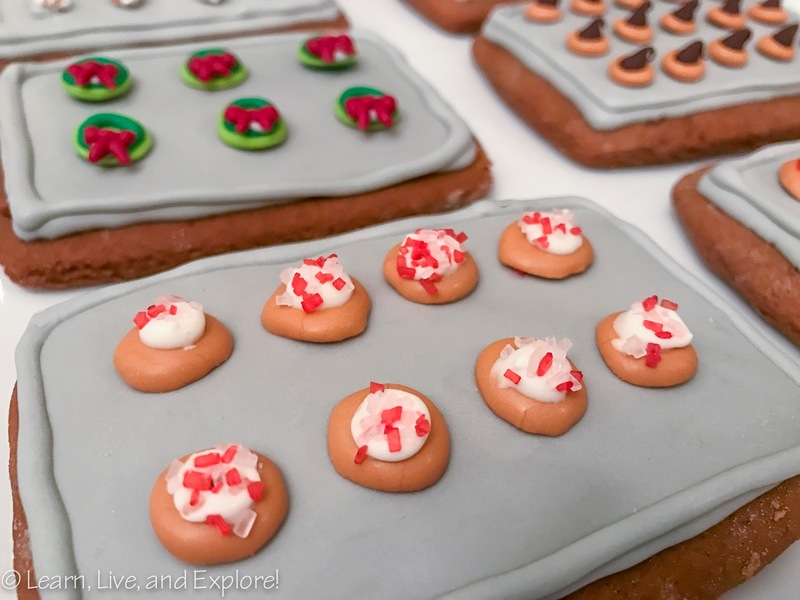 The royal icing is a standard recipe I got from my mom, but I always refer friends to Sweetsugarbelle for her flawless recipes and tutorials. The piping tips I used for the mini cookies were a #2 round or a #1 round (for very fine work like bows). Before piping any of the mini cookies, I lined a cookie sheet with parchment paper and taped it down. 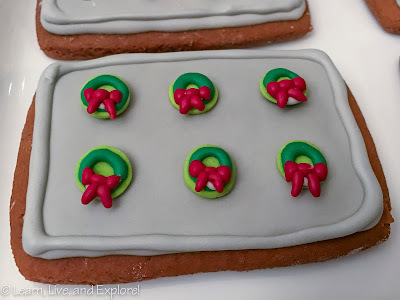 This is going to be your one spot to pipe all of the decorations separate from the iced cookies and allow to dry overnight or for several hours until they lift off the paper on their own. The base of the wreath is a Wilton confetti shaped sprinkle that came in a cylinder with green, purple, orange, and blue discs. Using a thicker royal icing, a green ring was piped onto the disc. Simple. The bows were piped in stages - two loops allowed to dry a few minutes, then knot in the middle allowed to dry a few minutes, then streaming ribbons on bottom. Adding the drying time ensures that the shapes of each section don't bleed into each other and you end up with an abstract mess. When the bow is completely dry, you can pipe a dab of royal icing on the wreath and attach the bow. The whole cookie can then be attached to the cookie sheet. Mexican wedding cookies are basically a butter cookie ball with pecan bits in it, rolled in powdered sugar. FYI, they are a huge mess to eat! 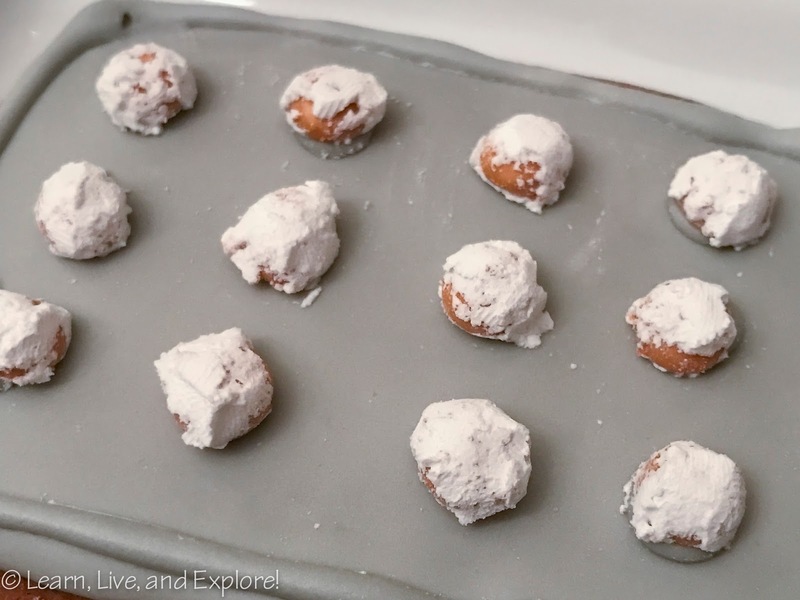 The mini versions were made by piping thick dots in the corner of my tray, then drowning them in powdered sugar to dry overnight. I'm not sure if the powdered sugar would have stuck if I didn't do it when the icing was still wet. I used the corner of the tray to try to keep the powdered sugar from making its way onto the other drying parts. The peanut butter kisses are one of my favorite cookies in regular sized form. 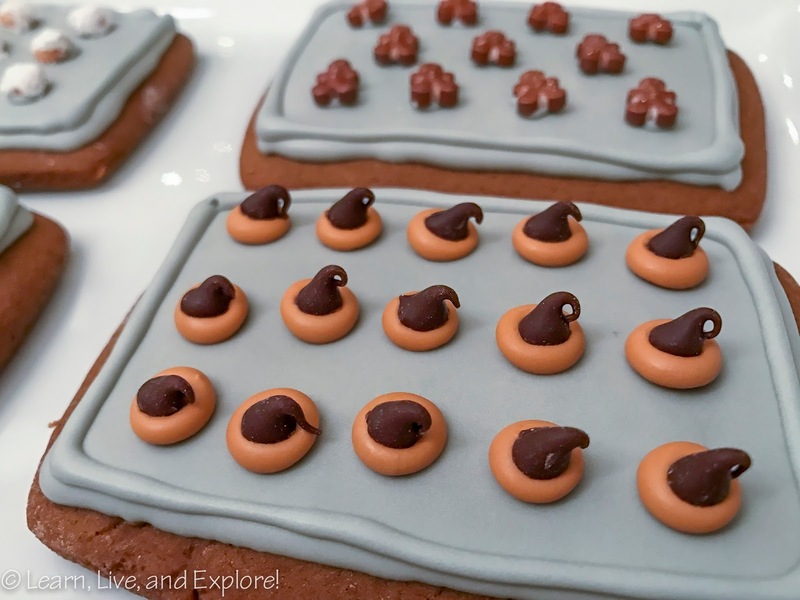 These mini ones were created with a generous dot of royal icing, immediately topped forcefully by a Nestle Toll House miniature chocolate chip to get the smushed look. I used Americolor warm brown gel very sparingly to create the tan color. Start with a drop, then add more a drop at a time to get your desired color. The frosted sugar cookie was more of the same tan royal icing for the base. I let it dry a little before piping on the white "frosting" and adding sprinkles. I also had some cookie sheets of gingerbread men in a couple of the photos. It would be very easy to make gingerbread men the same way I made the other cookies using piped royal icing on parchment paper, but why reinvent the wheel when Wilton now has gingerbread men sprinkles? Warning, the sprinkles do taste a little fruity, so they may not be the best pairing for the gingerbread base.